When I first moved to Ottawa, east coast-themed Grace O’Malley’s (now Gracie’s) seemed like one of the more promising targets for finding an authentic, Nova Scotian-style donair. The old menu had items like fried Chris Brother’s pepperoni, Acadian tourtiere, donair egg rolls, their “Grafton Street Donair”, and several other regional-ish dishes. Someone here either had some east coast roots, or really did their research. Alas, they have since undergone a big change. The new menu has been neutered of all the east coast-ish items, except for the donair, and what remains is indistinguishable from a dozen other generic pubs in Ottawa. When my wife and I arrived for a meal, we saw that the exterior and interior décor is still in transition – old signage outdoors, and a lot of maritime paraphernalia (lobster traps, buoys, etc.) inside. It all combined to give an awkward sense that Gracie’s hadn’t committed to any sort of new identity or vision for the business. With that encouraging feeling, we ordered our food. 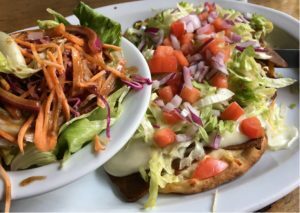 I stuck with the Grafton Street Donair ($16.75) and got the house salad as my side in a vain attempt to balance out the dietary equation. My wife stuck to the basics and went with their Great Canadian cheeseburger ($16.75). I should have paid a bit more attention to the description of the donair on the menu, because I wouldn’t have ordered the salad if I had – there was a LOT of lettuce on this “donair”. I know it’s common everywhere west of the Maritimes, but real-deal donairs – which Gracie’s is ostensibly aiming for – don’t. have. lettuce. With such a mound of greenery, this was a knife-and-fork job. The lettuce was as lettuce always is on a donair – an abhorrent abomination. The meat was OK, for pre-sliced, food service provider meat. It had some spice, and got some love from the grill, so it was better than the grey, pallid donair meat I’ve had at some shawarma joints. 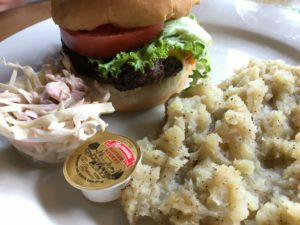 Gracie’s claims to make their donair sauce in-house, and it wasn’t half bad – lightly garlicky and applied generously, although it was too sweet for my liking. Their “donair” was on naan bread instead of a pita, and though it worked for a dish that is served open-faced, it isn’t done on Grafton Street (or anywhere near it) this way. For a refreshment, I had ordered one of their house-made wheat beers (they’re pivoting toward being a brew pub/music hall…). It was thin, possibly having been made from a pre-made wort, and was hoppier than most wheats. It was better than a Bud, and fairly cheap, but was still a big “meh”. My wife’s cheeseburger was a decent size, and the bacon had a great maple flavour to it, but the patty was markedly on the dry side. It seems that Gracie’s gave the east coast thing a go and it didn’t work out. It might play better in the downtown area where there’s likely to be a higher concentration of former east coasters working or going to school. 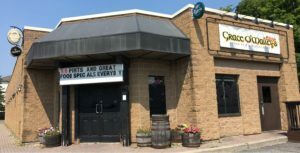 Unfortunately, we’ll never know now that they’ve sunken to general mediocrity at best, among the masses of forgettable Ottawa pubs.